The amphitheatre stands just outside the Roman walled area of the town. It once could seat a whole legion - up to six thousand spectators. Nowadays it is sometimes used for open-air events and re-enactments. Entry is free (except for special events) and there is free parking nearby in Broadway (off High Street). At the site of the amphitheatre, the sound of Roman soldiers' footsteps have been heard on occasions. Pictured left are the remains of the Roman amphitheatre courtesy of Greenshed. The apparition of a hooded monk, dressed in “a cream coloured habit” has been reported in a room of the Priory Hotel in Caerleon. It is said that the experience was not a frightening one, but left the witness “serene and happy”. 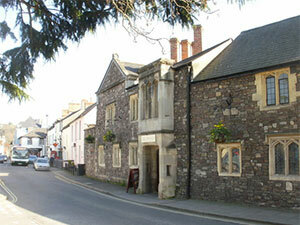 Pictured left is the Priory Hotel courtesy of Jaggery. For further information, please read The Ghosts of Gwent by Alan Roderick. Staff at St. Cadoc’s Hospital have reported that a figure has been seen running down one of the ward corridors, only to disappear completely. Nurses have gone to check mysterious sounds heard on their ward at night, only to find that a bed has moved into the centre of the room... with their sleeping occupier still in them! 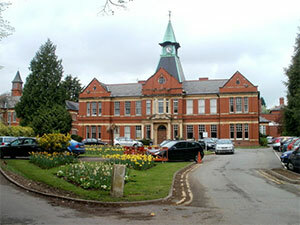 Pictured left is the south side of St. Cadocs Hospital courtesy of Jaggery. 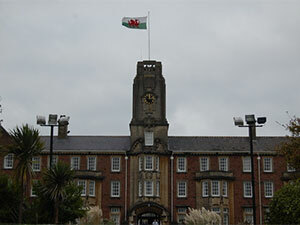 The University of Wales Campus in Caerleon has a distinguished history. It also has reports of ghostly centurions wandering the campus... Who will be on security when you arrive? The apparition of “a very large lady of over six feet” is said to walk along the corridors of the older parts of the University of Wales Campus. It is said to be the ghost of the former College’s Matron, who died after falling from the top of the stair well to the ground floor, some two storeys below. According to a feature in the South Wales Argus, "The ghost of a six-foot tall matron who roams the corridors of a university campus is being made the subject of a new book. The spectre of Bertha Ramsey is said to be a familiar sight to staff at the University of Wales College Newport's Caerleon campus since her death in 1962. Big Bertha's ghost, described as a woman wearing a brown overall with her hair pulled back in a tight bun, is a well-known phenomenon among security staff who patrol the campus at night. Many claim to have heard strange noises and seen pictures knocked crooked while making their rounds." Pictured left is the Clock Tower of the University of Wales Campus courtesy of Gail Franklin. Caerleon (Welsh: Caerllion) is a town situated on the River Usk in the northern outskirts of the city of Newport, Wales. 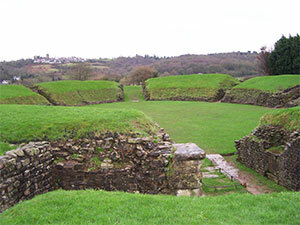 Caerleon is a site of archaeological importance, being the site of a notable Roman legionary fortress, Isca Augusta, and an Iron Age hillfort. Pictured above left is a view towards Caerleon courtesy of Marky-Son. Licensed under CC BY-SA 3.0 via Wikimedia Commons.